High ground-level ozone concentrations in Central Texas are the result of a complex interaction of emissions and meteorology. Ozone levels in Central Texas would be about 27 ppb in 2017 without any biogenic or anthropogenic emissions from the U.S.
NOx emissions are generated primarily from anthropogenic combustion sources, while VOC emissions are generated primarily from vegetation. 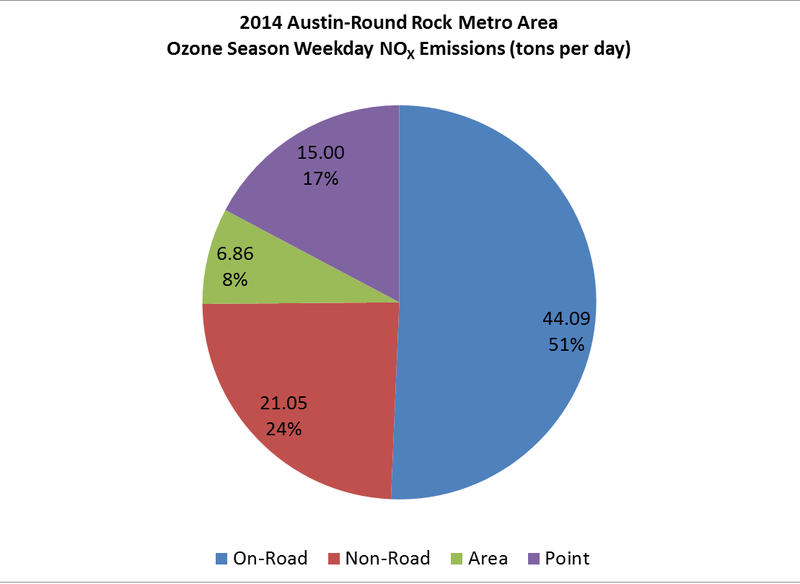 As the figure below shows, about 3/4 of the typical ozone season weekday NOx emissions in the region are from on-road and non-road mobile sources, with the rest coming from large point sources and smaller stationary "area" sources.